Advertising on social media such as Facebook, Twitter, LinkedIn or Instagram can be extremely valuable for both B2B and B2C companies. In fact, for many of today's innovative companies, social media is the primary channel for online and mobile advertising. KeyMetric helps you maximize the value of your social media investements by tracking inbound phone calls (and other online customer engagements) across all your social pages, advertising and content. By adding a unique toll-free or local phone number to your social profiles, ads and posts you can track calls to accurately determine customer engagement and conversion rates. Create a unique URL, or tag your existing website URL to track when customers click-through to your company website (they will see the same phone number on your website as on the social network they arrived from) to caluculate ROI for every marketing dollar. To track calls from a Facebook page or ad campaign you would assign a unique toll-free or local phone number to track all inbound calls. You could also use a unique URL or subdomain to your website that identifies Facebook as the unique source; allowing KeyMetric to display the same phone number on your website. To track calls from your LinkedIn profile or ad campaign you would assign a unique toll-free or local phone number to track all inbound calls. You could also use a unique URL or subdomain to your website that identifies Facebook as the unique source; allowing KeyMetric to display the same phone number on your website. To track calls from your Instagram profile or ad campaign you would assign a unique toll-free or local phone number to track all inbound calls. You could also use a unique URL or subdomain to your website that identifies Facebook as the unique source; allowing KeyMetric to display the same phone number on your website. This same process applies to an unlimited number of social networks, accounts and advertising campaigns. Simply identify your campaigns using a unique URL or by adding the tracking code to your exitising URL. 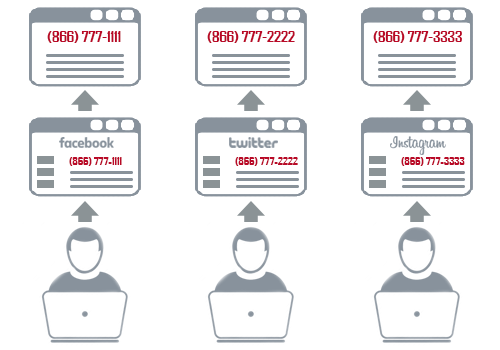 Session-based Intelligent Number Insertion (INI) allows for the tracking of calls from unlimited referring domains, traffic sources, ad campaigns and PPC keywords using a fraction of the phone numbers needed by other solutions. Record every inbound phone call (optional) to identify important trends and information, improve sales and customer service, and asses the quailty of your leads, sales opportunities and overall business performance. Include a "Whisper Message" for inbound calls to pre-identify the traffic source, ad campaign or source for the call. Only your employees will hear the whisper message while the customer continues to hear the phone ring. Quickly and easily add call notes, sales values, call quality ratings, follow-up notices or other valuable information for every phone call. Add, edit, share and/ or delete notes as needed at anytime; even after the call is completed. Display a unique toll-free and/ or local tracking phone number on a single web page for each unique location and/ or department. Perfect for business directories, office location pages, franchise listings, dealership pages, etc. Integrate KeyMetric call and campaign data with nearly unlimited third-party tools including Google Ads, Google Analytics, Bing Ads and Salesforce.com via our real-time API and integrations tool box. Copyright© 2007-2019 KeyMetric, Inc. All Rights Reserved.